Binomial model, which can be used in order to valuate american and other path-dependant options, is iterative, which means that the value is computed in a number of steps or iterations. By increasing the number of iterations, better precision can be achieved at the penalty of more time spent in calculations. This study shows how the calculated value of an american put option depends on the number of steps used by the model. 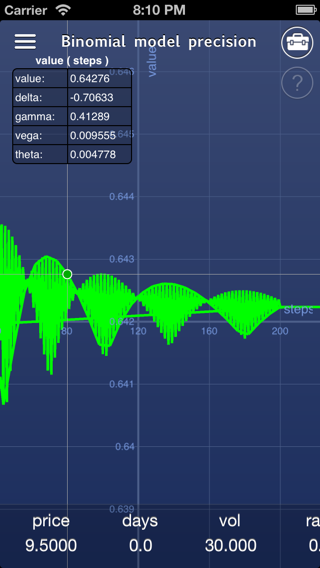 As you can see, the value narrows in on the theoretical value as the number of steps increases. You can also study the precision of the binomial model when calculating the greeks, by changing the graph type. Want to learn more? Download now an interactive reference application for iPhone. This is an excerpt from iOptioneer option trading reference application. In order to build the real-time dynamic strategy graph and run simulations you will need to download the application from App Store. If you have any questions about the application, you can write to us at support@ioptioneer.com.